The FIU Police Department is committed to providing a safe campus to students, faculty, and staff. 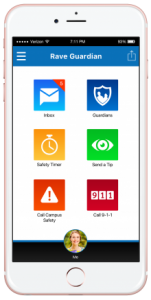 With the free FIU Guardian mobile app, powered by Rave Guardian, all FIU Panthers can use their mobile devices to improve their personal and on-campus safety. Includes your personal information, like your address, medical details, personal photo, etc. Set the safety timer when you’re alone or in an unfamiliar place. If the safety timer expires and is not deactivated, your designated Guardian will be notified via an alert . Your Safety Profile is only accessible to FIU’s Police Department when the panic button has been pressed, and will continue to be available only until you’ve been assisted. Panthers can communicate with law enforcement by providing tips through text and images. Tips can be sent in anonymously.